Long, and lush in a silky, soft and smooth natural bamboo fibre blend, our ladies SockShop Paisley and Striped Bamboo Knee High Socks look very stylish in their polka dot and super-sized paisley curl motifs, contrast colour toes and heels. The socks are made with honeycomb pattern cuffs for a comfortable grip, and finishing with hand linked toes for smooth seams removes pressure from toe joints to protects against rubbing and blisters. 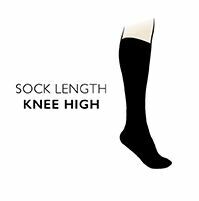 Even better, these socks feel wonderful against the skin, and happily, are wearable for all skin types, even those normally irritated by knitted fibres. This is because bamboo has a growing reputation for its long list of benefits, such as its rounded, long staple fibres that don't trigger allergic reactions, and its natural resistance to bacteria and odour. The use of bamboo brings greater moisture absorbency and a unique thermo-regulating capacity, so you stay dry, fresh and comfortably cool.